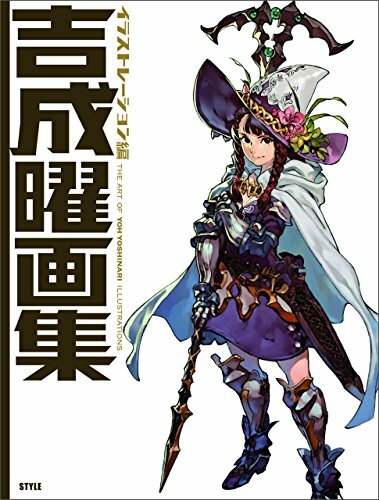 For years, I've been trying to find out who's the artist behind the character illustrations of Valkryie Profile and it's actually Yoh Yoshinari. Finally! The illustrations he drew for Evangelion look really polished with the recognisable clean anime style colouring. However, he also has other styles, such as the manga colouring style. After all these years, I still love his character illustrations for Valkyrie Profile, in particular the standalone character profiles of which only six are included. The rest are full page splash art. The illustrations for Gurren Lagann are awesome as well. Throughout the book, the drawing style switches from anime to the painted comic look. There are also some sketches, drafts for the full coloured paintings and black and white illustrations. In addition to all those titles mentioned earlier, there are also miscellaneous work he has created for other titles as well, just that they usually one-off hence all of them are grouped under Other Works. The Little Witch Academia artworks are really cute. Overall, the art is beautiful and I enjoy seeing the different styles, and of course artworks of the animes and games that I love. Highly recommended to those who like anime and manga art.